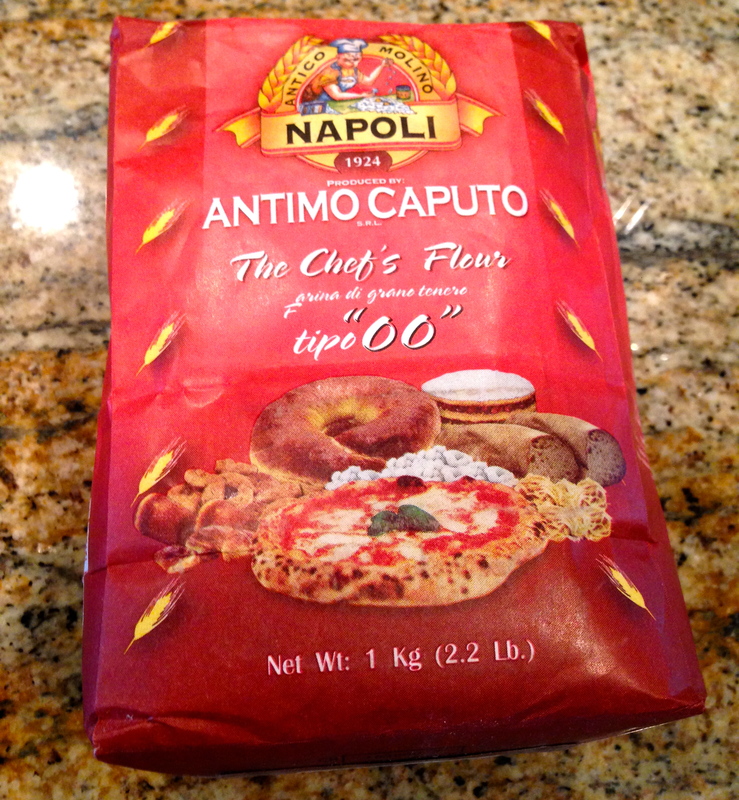 Oh boy do I have a great pizza recipe for you…. 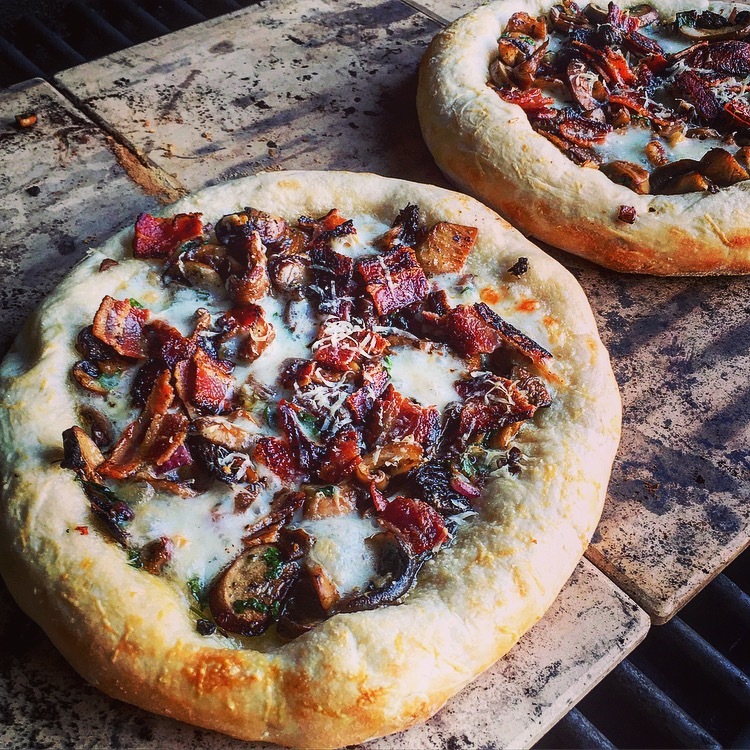 The inspiration for this Bacon Mushroom Pizza Bianca (no sauce) came from one of the best dining experiences I ever had in Burlington, Vermont. It was December and we had just finished up our busy fundraising season and the husband had surprised me with a little get away. I had done a little research on restaurants in the area and one of the top rated places was this farm-to-table restaurant called Hen of the Wood. I called to try and get us a reservation for 2 but they were booked solid for the next two weeks. The hostess however told me that they did serve a full menu at the bar but it was first come first serve. So the next evening we got to the restaurant about 5:30 and there were two seats open at the back bar for dinner. However this wasn’t like sitting at any normal restaurant bar, instead of over looking the bartender making drinks, the back bar was over looking a completely open concept kitchen. All night we watched the cooks scurrying around the kitchen preparing the food, maneuvering all the cast iron skillets in the huge wood burning oven, and drooling at every dish that came out of the kitchen. I swear we ordered half the items on the menu that night. 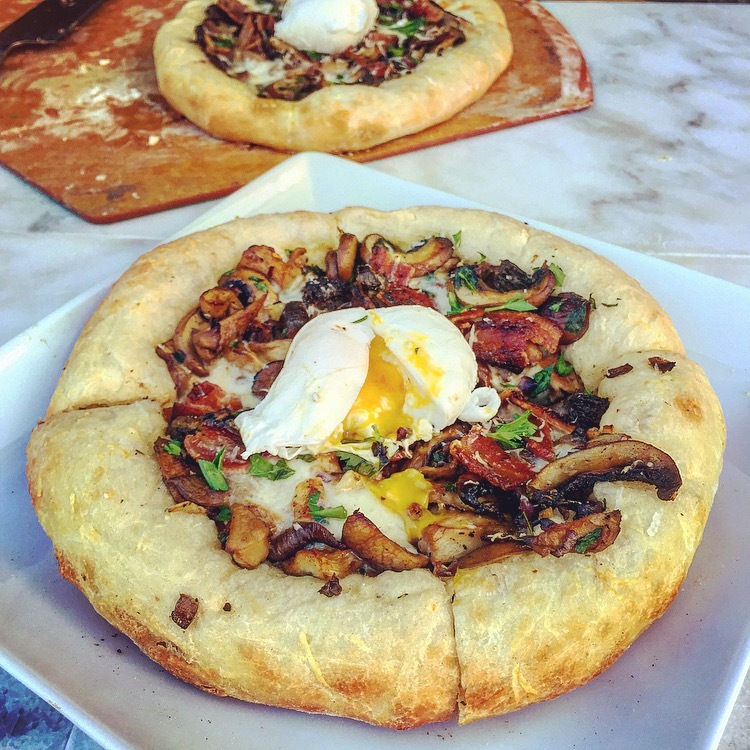 One of my favorites being the Hen of the Wood Mushroom toast which was a blend of sautéed mushrooms including Hen of the Woods mushrooms, bacon, herbs, garlic, a poached egg all on top of delicious locally baked artisan bread. I’m telling you it was one of the best things I had ever eaten. So imagine my excitement when I saw fresh Hen of the Wood Mushrooms the other day at the grocery store. I had never seen them in the store before and I ran across the produce section to grabbed a package of these mushrooms. Then I saw the price they were $39.99 per pound! I quickly put the mushroom back but I still wanted to recreate this delicious mushroom toast. I looked around at the other mushrooms and opted for nice selection of porcini mushrooms, dried morels, and dried oyster mushrooms. I was going to recreate this mushroom toast with my own little twist. While I don’t make fancy artisan bread I do make darn good pizza dough so why not make a Bacon Mushroom Pizza Bianca (No Sauce Pizza)? Add the yeast to the warm water and let it sit for 5-7 minutes until bubbly and frothy. In the bowl of a food processor add the “00” Flour, Bread Flour, Salt and Extra Virgin Olive Oil, pulse to combine. With the machine running slowly stream in the yeast and water mixture and then the white wine (NOTE: This will be a VERY wet and sticky dough). Dump the dough out onto a well floured surface (adding more flour as needed) and knead the dough for 5-7 until the dough is smooth and no longer sticky. Divide the dough into 2-4 dough balls and knead into shape. Then place each ball into a lightly greased bowl, cover with a damp tea towel, and place in a warm place to rise for 1 hour. After the dough has double in size punch it down knead it back into a ball, cover it, and let it rise again in a warm place while you prep the toppings. Preheat the oven to 475 or Grill to 475-500 degrees if cooking on a pizza stone be sure to preheat these as well. Add the dried morels and oyster mushrooms to bowl with the hot water and wine, cove with plastic wrap and let them rehydrate for 20 minutes. Once hydrated, drain the mushrooms (save the liquid for soups, stocks, or risotto) and squeeze out the excess liquid and roughly chop the mushrooms. Heat a large skillet over medium heat and cook the 4 strips of bacon until crisp then remove from the pan and set aside. Drain off any excess bacon grease then add 2 tablespoons of butter to the skillet along with the sliced Porcini mushrooms and sauté until golden brown. 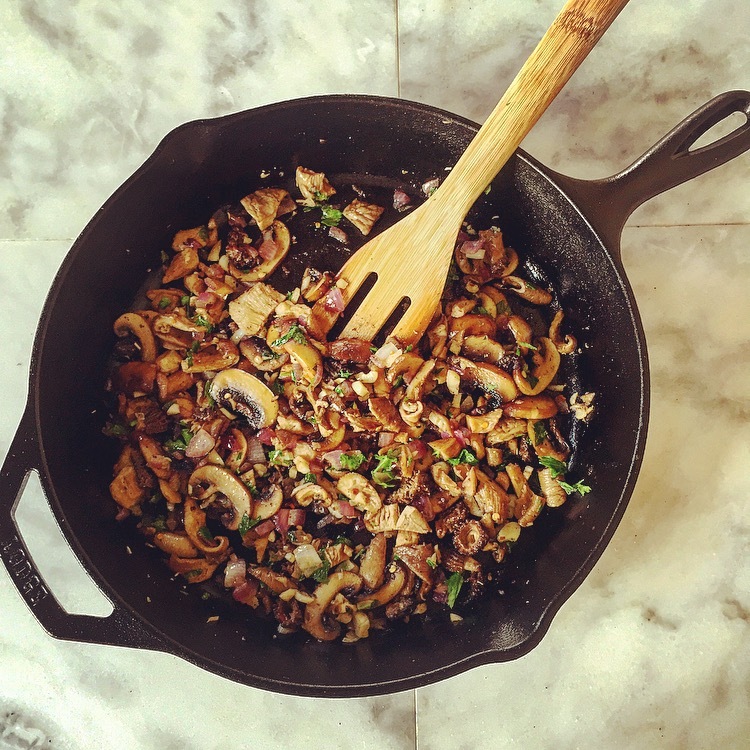 Once the mushrooms are browned add in the rehydrated mushrooms, onion, garlic, oregano, half the chopped parsley, red pepper flakes and a drizzle of olive oil. Season the mushroom mixture with salt and pepper and sauté until the onions are tender then set aside to cool. Once the dough has risen for the second time lightly punch it down in the center then remove the dough from the bowl and stretch it into desired thickness. I like a very thin bottom crust with a thick edge crust. Once the dough has been stretched place it on a well floured pizza peel if cooking on a pizza stone or on a pizza pan if cooking in the oven. Drizzle about 2 tablespoons of olive oil onto the dough and grate on a little fresh Parmigiano Reggiano Cheese. Tear the fresh mozzarella into small pieces and dot them around the dough. Top the pizza with the mushroom mixture, crumbled bacon, and a little more Parmigiano Reggiano Cheese. *If cooking the pizzas on the grill cook until the bottom crust is crispy and the toppings bubbling about 7-8 minutes. Turn the crust 2-3 times for even cooking but keep the grill lid shut as much as possible to maintain the temperature. *If cooking the pizzas in the oven on a pan or pizza stone bake at 475 for 10-12 minutes. Allow the pizza to sit for 2 minutes then tops with fresh parsley and a poached (or fried) egg. Sigh…thanks Mel you’ve just given me a pizza craving and i’m trying to be a good girl this week;) looks delicious! Wow this looks and sounds amazing! I am actually weirdly heading to burling, VT this weekend for a Labor Day getaway with my husband…we definitely need to check this place out!!! Lucky!! You must check out the Hen of the woods restaurant it’s to die for good!! These photos are mouth watering Mel!! And I totally with you- trying to recreate a meal you eat out on a trip. I’m always trying to taste every flavor and figure if I can some up with the same thing. fun post! Thanks Rhonda!! Have a great Labor Day Weekend!! Hi Mel–we are having in great weekend– up in San Francisco visiting our kids! This looks really different and delicious! Very delicious and looks amazing! Thanks 😀 Kathryn!! Hope you had a wonderful little getaway I can’t wait to read all about it!! I didn’t really blog about it this time, but we had a great time!